Peacefully at the Ottawa Heart Institute, Saturday, March 17, 2007. Beloved wife of 53 years of Paul. Proud mother of Debby Boone (Bill Letcher) and David. Loving grandmother of 9 grandchildren and a great-grandmother to Owen. A 50 year member of Beta Sigma Phi sorority. Founder of the Tweed Chapter and currently a member of Beta Master Chapter. Special thank you to Betty and the other nurses at the C.C.U. at the Ottawa Heart Institute. 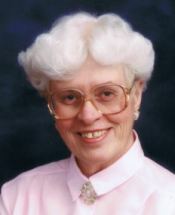 A Service in Memory of Betty will be held at Christ Church Cathedral at a later date. Interment of cremated remains at Elmwood Cemetery, Perth, in the spring. In Memoriam donations to the Ottawa Heart Institute appreciated.